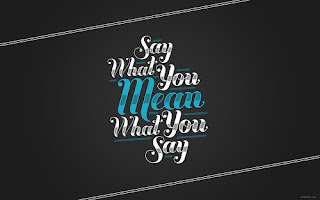 I was having lunch with a good friend the other day and we were remarking that there is a serious lack of people that we know that actually say what they mean. I mean really say it. I mentioned to him that I knew a guy back in university that used to do just that and it would make me literally hide under the table when he was that honest with people. He didn’t sugar coat, he didn’t mince, he just said exactly what he meant even if it didn’t sit well with its recipients. If a person said to him, 'good seeing you, we should exchange numbers and get together,' he would look at them and tell them (relatively politely, but very matter of fact) that he didn’t think so as he had no intention of calling them. Trust me, this was always followed by a significant silence. Even our colloquial speech is riddled with non-direct, misleading, non-specific phrases that really don’t say what we mean (or mean what we say). ‘I’ll be there in a minute.” Really? Will you? Cause I know that when I tell the King he can go outside in a minute when it’s 6am I definitely don’t mean it (‘soon’ just never cuts it with him). Or what about when you tell someone they look great and they don’t, or you love their haircut (but are really trying to figure out how they left the house without a bag on their head). You’re just being polite or sparing them from your real thoughts, which are usually,' you look tired and damn you’ve aged since I last saw you' (of course there are many times when they do look great, but we’re not talking about that now are we?). But you wouldn’t say that cause it’s just rude. Then again, the fact that we’re all walking around not saying what we really mean – at times – is also pretty rude and deceptive if you really think about it. Back to this friend and I, we have a pretty honest relationship, and he will happily – or not so happily – tell you that with him I can often be too honest. I tell him when he’s wearing an outfit that will never get him a woman, or when I think he needs to cut his hair, or when he’s being dysfunctional (this speaks from experience) and needs to sort it out. I’m sure he’s thrilled to have me in his life. But I will happily admit that he’s one of the most refreshing friendships I have based on the fact that I can always tell him what’s on my mind. And for the most part, I try to seek out people that can handle the truth. Those that cannot take a lot of energy and handholding, I can tell you that much. So I dare you; this week, try it. I will too in fact, cause I’m certainly very guilty of playing the diplomat and choosing the path of least resistance when it comes to communication. 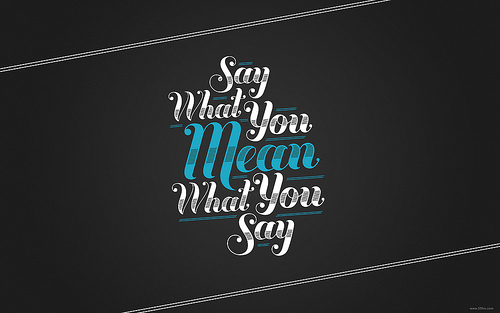 Every time you speak to someone this week, say what you mean. What you mean exactly. Don’t sugar coat it, if it doesn’t need to be. Obviously don’t get punched in the mouth by telling the wrong person your opinion but just try to speak from a place of genuine honesty. Even if you feel like telling the bank teller that you wish she would not talk so much to the other customers when the line is half a mile long. You know, be Larry David (if you’re not a fan, GET on board already) for the week. I have a feeling he feels unencumbered and pretty damn liberated most of the time.